The Oracle AVG function is a common function in Oracle SQL. I’ll explain how to use it in this article and show you some examples. 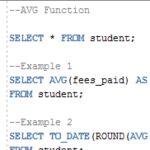 The AVG function calculates the average of a series of values that you provide to it. Most of the time, this will be a particular column that you specify, so the average will be all of the values in that column. Just like the MIN and MAX functions, the AVG function is a SQL standard column. It works in many different versions of SQL. In this article, I’ll be looking at the Oracle version. There are two ways you can run the AVG function – as an aggregate function, or an analytic function. expr (mandatory): This is the expression that is being used to calculate an average. It can be a set of values, a column name, or any other valid Oracle expression. analytic_clause (optional): This is used when you want to use AVG as an analytic function. It works similar to grouping data with the AVG function, but it’s a bit different. Refer to the examples below for more information. Can I Use Oracle AVG for a Date? You can use the AVG function to calculate an average date, if that’s what you need for your situation. See the examples for the output of this. Thanks to user “Dan A” from StackOverflow for this solution. For more information on these functions, read my guides on the TO_DATE, TO_NUMBER, and TO_CHAR functions. How Does the Oracle AVG Function and NULLs Work? The AVG function, and all aggregate functions, ignore any NULL values that it finds. This is because NULL values are unknown, and not equal to 0. If you were to perform an AVG on this, you will get 4. (5+6+2+3+4 = 20/5 = 4). The NULL value is not included. If you wanted to include it, or treat it as a 0, you can use the COALESCE function to convert it to 0. You would then get an answer of 3.33 (5+6+2+3+4+0 = 20/6 = 3.33). What Does The “Oracle AVG Over” Do? Using the OVER keyword on the AVG function lets you write it as an analytic function. This means you can use it in a different way. This OVER clause allows you to specify what you want the AVG function to be grouped by, or what it is contained to. Normally, the AVG function gets the average of everything you supply it. You can use the OVER clause to specify that you want the average of a certain group of fields (e.g. the AVG salary of employees in each region). Have a look at the examples below for more information. Here are some examples of the AVG function. I find that examples are the best way for me to learn about code, even with the explanation above. This is the table that I’ll be using for these queries. This is a simple example using a number field. This example uses a few functions to find an average of a date field. This example uses a GROUP BY clause to group the averages by the gender field. This example uses the HAVING clause to restrict the rows returned after the GROUP BY has been applied. This example uses AVG as an analytic function. It finds the average fees per month. MIN – This function gets the lowest of the supplied values. It’s the opposite of the MAX function.